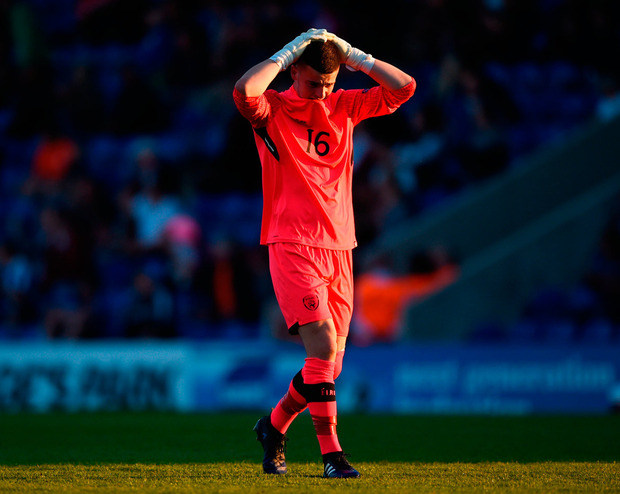 The outpouring of messages of support from around the football world may help, slightly, to ease the pain of Ireland's young footballers as they cope with the fallout from their defeat to Holland in the European Championships. But the pain will only return, with a vengeance, tomorrow when the Dutch play England in the semi-final. Players who were still getting used to life in primary school around the time of the Thierry Henry handball know have their own drama to file away for future reference. But even though, for the second year in a row, Irish interest in the U17 Euro finals ended at the quarter-final stage there is lots to take from what this team has done, not just at the tournament in England but in qualifying, in itself a success. And we can only hope that the decision-makers in the Irish game now take the time to listen to the voices of those people who put players like Jimmy Corcoran, Troy Parrott, Adam Idah and Nathan Collins where they are. The issue of player production has never been as pressing: the number of Irish-eligible players who played in the Premier League this season (17) is the lowest on record, so the progress of players like Parrott (Spurs) Seán Brennan (Southampton) and Ryan Cassidy (Watford) is so, so crucial. Figures within the game, strong voices, have expressed deep concerns about the rush towards a national league, from U13 level up to U19 level, and how the schoolboy clubs which nurtured these talents have been sidelined. Vincent Butler, a stalwart of Belvedere and a man who helped start off countless careers, including that of Wes Hoolahan and Parrott, one of the Irish U17 stars over the last week. Back in February, Butler took to social media to say what a lot of folks in the realm of football nurseries thought. "The new u15 and u13 Nat. Leagues will destroy Clubs, under age development and assist GAA and Rugby recruitment," Butler said. Butler's protégé Hoolahan has been invited to Lansdowne Road for next month's friendly with the USA to say goodbye to the Irish support, but has Butler been invited in to expand on his views?People at clubs like Belvedere, St Kevin's Boys and College Corinthians feel frozen out. A media release from the FAI's media department before the U17 finals had pen pics of the players with their current club, stats, birthplace and where they attended the FAI's "Emerging Talent Programme Centre of Excellence" - but did not mention their schoolboy clubs. League of Ireland clubs are trying to bridge a yawning gap in producing talent, but if Ireland are to keep having a say in events like the U17 Euro finals, then figures in the game need to have a say. And be heard. One man who can hold his head high is the player sent off, Jimmy Corcoran. The Meath lad has a lot to look forward to in the game as he has already agreed to join Preston for next season from Cherry Orchard. Current and former internationals took to Twitter to express their support for the teen, but post of the day has to be the one from his pals from his GAA club back in Meath, Drumbaragh Emmets, his GAA club back in Meath. "We got the absolute sh1t kicked out of us tonight in the BFL. But the roar coming out of the dressing room when Jimmy Corcoran saved the spot kick almost sent the clubhouse roof into orbit! Whatever happened afterwards will rumble on for a few days, but to every man, woman and child in the club - we are incredibly proud of the international you have become," the club said in a Facebook post.